We reported a few months back that Samsung was working hard on developing alternative technologies for its next-generation premium TVs. The company has particularly been focusing on MicroLED technology and it has unveiled its latest creation at the Consumer Electronics Show 2018 today. Samsung has unveiled a massive new TV today called “The Wall.” The company describes it as the world’s first modular MicroLED 146-inch TV. It features self-emitting MicroLED technology with micrometer scale LEDs that are much smaller than existing LEDs. 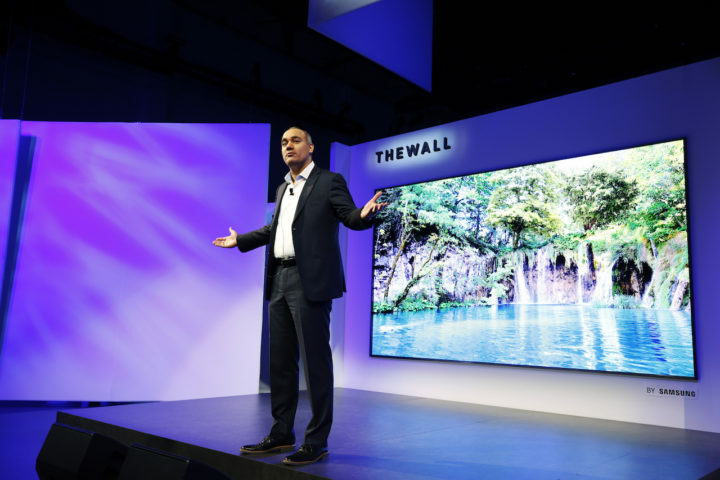 Samsung has been betting on MicroLED technology to boost its premium TV business. While the company is no longer interested in making OLED TVs, MicroLED does share some traits with OLED. Both are made with light-emitting diodes and they’re self-emitting. What that means is that each sub-pixel produces its own light and there’s no need for a dedicated backlight. MicroLED panels thus offer deep blacks and high contrast ratios like OLED panels with the added benefit being the relative ease with which they can be manufactured. These panels are also thinner than their OLED counterparts. 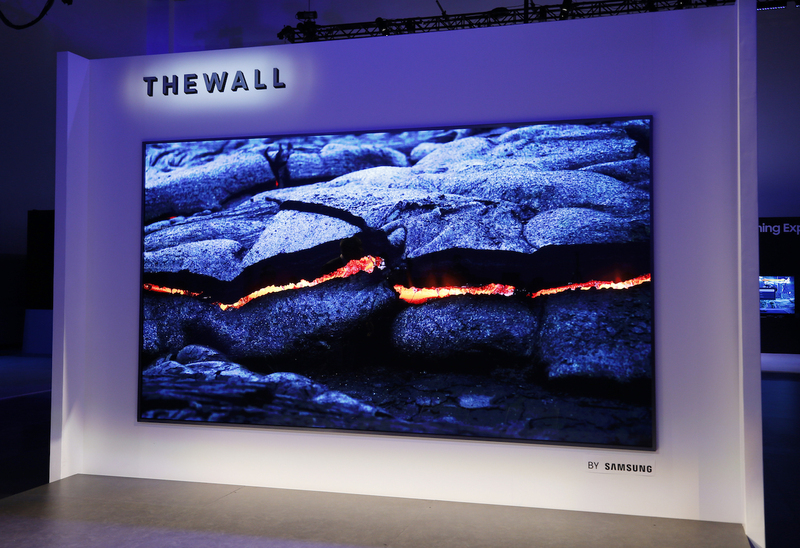 Samsung’s The Wall is the world’s first consumer modular MicroLED TV. It can transform into any size and deliver incredible color gamut, color volume and black levels. The TV itself has a module-based, bezel-less design which allows customers to customize the TV’s size and shape as per their preferences. It can adapt to serve different purposes such as creating a wall-size display for multiple spaces. The company hasn’t revealed how many modules it’s going to offer with this TV. It didn’t even specify how many modules were in the concept that it unveiled at CES 2018 today. 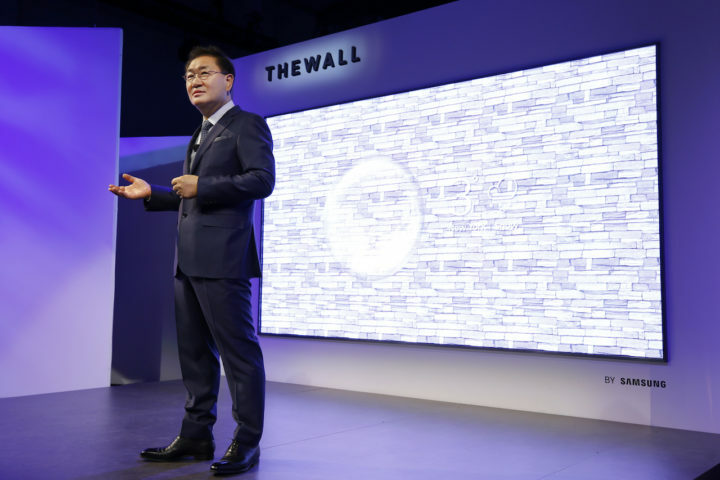 Samsung has said that it’s going to reveal information about a global launch for The Wall later this spring. this is like the lego of TVs. today i have a 65″, then i buy a couple of slabs and make my TV 85″. nice idea. time to upgrade my set in the next 5+ years. MicroLED should not suffer from Burn-in issues, right? looks like a good idea for commercial installs in restaurants & shops if the price is reasonable.